When a new Chinese restaurant opened up just a block from his work, Steve was ecstatic that he could go there during his lunch break. He loved Chinese food! He immediately started eating there several times a week. He figured that he was eating fairly healthy, since most Chinese dishes rely heavily on vegetables and rice. That’s why he was shocked when his doctor told him that his blood pressure and cholesterol had gone up since his last appointment, which was right before he started patronizing the local Chinese restaurant. After the doctor told him that his new lunch spot might be contributing to his health problems, Steve was bummed that he may be forced to give up his new favorite lunchtime hangout. I understand his disappointment at the thought of giving up his favorite food, but is it really necessary for him to give up Chinese food in order to be healthy? If you have ever visited China, you will quickly realize that Chinese food in America is not the same as Chinese cooking in China. Authentic Chinese food is healthier for multiple reasons. First, it is minimally processed and focused more on grains, vegetables, legumes, nuts, seeds and fruit. And secondly, it contains only small amounts of meat, if any, and no dairy products, such as butter, cheese or cream. In the United States, many of the Chinese dishes that we have come to love are americanized versions. That means you can expect fried foods that are immersed in heavy, unhealthy sauces served over rice and vegetables. So, what you end up with is a dish that is loaded with saturated fat, calories and sodium and a far cry from being healthy. What should I order to make it healthier? The good news is that you can eat healthy at a Chinese restaurant if you choose wisely. Below are seven tips you should follow the next time you dine out at a Chinese restaurant. Substitute brown rice: Rice is a staple of most Chinese cuisine, and brown rice is more nutritious than white rice and is available in most restaurants. So, ask for it whenever you can. Avoid crispy, deep fried, breaded and batter coated foods: These foods tend to be high in unhealthy fats. And a diet high in saturated fats has been linked to an increased risk of heart disease and stroke. So, even though spring rolls and egg rolls have vegetables in them, don’t let that fool you, they are still unhealthy choices due to the cooking techniques used to prepare them. So, eat these dishes in moderation or, better yet, not at all. Avoid spare ribs and sweet and sour dishes: These dishes tend to be high in fat and calories. Choose low sodium soy sauce: This choice has significantly less sodium then regular soy sauce. Ask to have your food steamed instead of fried: Steaming is a much healthier option than frying because your food won’t be soaked liberally in cooking oil. Ask for your meal to be prepared with less oil and salty ingredients: Ask your server to reduce the amount of cooking oil and salty ingredients (such as soy sauce) in your order. Ask for more vegetables, preferably steamed: Pick dishes that have very little meat and ask if the proportion of vegetables can be increased in your entree. 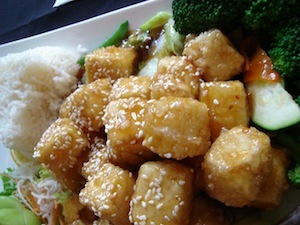 If you’re with a group, try to include one or two vegetarian dishes in your order. Eating a healthy dish at a Chinese restaurant outside China can be more challenging, but not by no means impossible. You just need to choose wisely and request certain substitutions and cooking preparations. The extra effort needed to customize your dish, will be well worth it to your health. Plus, it will make your next visit to the doctor more enjoyable. I liked how you mentioned that brown rice is healthier for you and how it is available at most Chinese restaurants. It is important to remember that taking the time to understand how to eat healthy when eating Asian food can help you avoid any unpleasant experiences when eating out. My brother in law is trying to eat healthier but loves Chinese food, so I’ll make sure to share your page with him.